A Collaboration of Modern Contemporary and Mid-Century by MOPS Architecture Studios and ONI Render. A combination of simple furnishings is equally capable in commanding an aristocratic and palatial decorative flair, rather than just attempting so with the quintessential marble and antique elements. 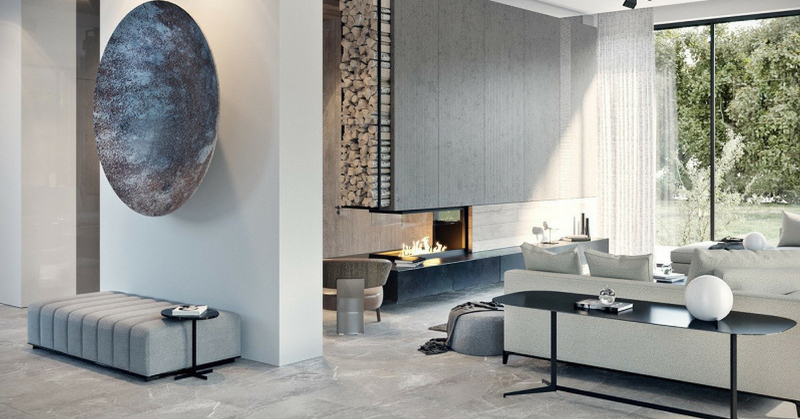 A fusion between modern contemporary and mid-century styles fashioned within an exclusive residence just outside of Moscow, Russia, exhibits that even the simplest of materials can raise standards into true lavishness. With a few selected extravagant pieces for the collection won’t hurt your budget, since the existence of economical furnishings is most prominent in the market, as compared to the pricier marble and antique components. The open floor plan that segregates the living, dining, and kitchen areas by carefully erected wall partitions emphasizes different sections in an almost maze-like manner. Steady indoor plants are positioned strategically to enhance the outdoor’s natural beauty, and to give off a relaxing and cozy atmosphere of yearlong greenery. The pop of green furnishings blend well into the greyish base throughout the estate, adding a little neat personality along with it.